Rust is an unfortunate fact of life that seems to need to be lived with. Unfortunately rust seems to ruin anything we have that is made out of metal. It is said that more cars are ruined by rust than car accidents, which is an astonishing fact. Rust comes in the form of salty air that cause corrosion on metals, excessive water on metal, or the use of salt on roads in cold climates. Rust is a chemical reaction which occurs on bare metal and oxygen, or oxidation. Unless the metal is a truly expensive metal in the form of stainless steel, then chances are good if you do not protect metal it will go through rusting and corrosion. The only way to prevent this occurrence is to put a protective coat over the metal, which is usually in the form of a rust paint. This rust paint will protect the metal from rust and corrosion, which will increase the life expectancy. Here is why you would want to prevent rust, as well as ways to prevent rust. 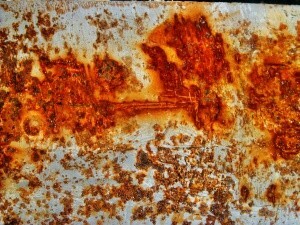 Rust is a natural occurrence, which occurs as a chemical reaction of the elements oxygen and iron, or other metals. The results tend to be the orange colour that appears on the surface of a metal. This is not just a coat, but what is actually occurring is metal and oxygen are bonding together, which means there is less metal to provide the structure with support. When metal is left to rust for a long period of time it will become brittle, and can then break, fracture, or the structure it is being used for could collapse. All these scenarios are not uncommon if the correct precautions are not taken to protect the metal. Also, if metal is left to the environment it will become very costly to repair the damage of rust, or replacement might be needed. The solution to this problem in Australia is to use a rust paint. A rust paint allows for a protective coat to cover metal, which will create a barrier between the negative oxidation forces of metal being exposed. Rust paint is applied to the surface of the metal which will then protect the metal from rust and oxygen. This will not only lower the cost of maintenance to the metal, but it will also eliminate the chance of rust destroying the structure before its calculated expectancy. Rust paint can also serve as a way to paint a structure to come more appealing, with the use of rust paint collars. Also, rust paint can be used to create a roughened surface for walking on. The proof of rust pain is in the customer list. Customers such as the United States Navy utilise rust paint for the prevention of rusting. As you are building your next structure out of metal, which is rust prone in the elements, think of applying rust paint early and often. The use of rust paint will extend the life of the structure, as well as lower the cost of maintenance.